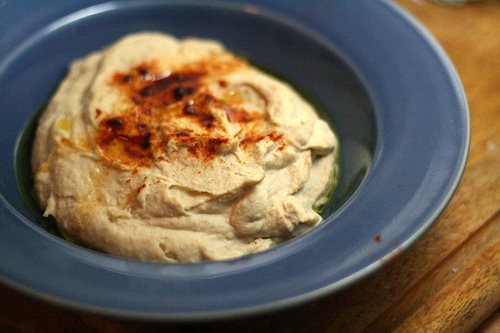 Once you make your own hummus at home, you'll never want to buy the pre-packaged store-bought stuff every again. It's simple, quick, cheap, and doesn't even take that much effort to clean up the mess. If using dried chickpeas, just make sure to thoroughly cook them first. You can speed up the cooking time by soaking them overnight in cold water. Remove the skins after cooking by simply putting them in fresh water and rubbing the beans between your fingertips. They'll slide off and float the top. If the skins are still on, it's not a big deal, as the recipe will still turn out just fine. Serve room temperature or slightly warm, and garnish with a few whole chickpeas, a dusting of paprika, and a good glug of olive oil. This recipe is entirely flexible. You can add any other ingredients and flavorings that you like, such as roasted red peppers, sun dried tomatoes, more garlic, more lemon, lemon zest, olives, parsley, even almonds. Hummus keeps in the refrigerator more than a week.